Home Uncategorized Basil Brick Oven Pizza! The last time we spoke about finding the perfect pizza in Astoria – our page exploded. We had no idea you all were so passionate about pizza! Suggestions came pouring in – and Basil Brick Oven Pizza was at the very top. Now, we’ve had Basil before, and we weren’t crazy about it – so we thought “Hm… maybe we’re missing something..” and headed on over to try it with new eyes (and mouths). Here’s the thing: we love pizza. As in we eat more pizza than we can admit without feeling ashamed. But we’re not food critics – we won’t critique the levels of taste and the hidden scent of secret ingredients – we just like good, tasty food. Especially pizza. So there’s no exact science to picking a favorite – we just pick what we enjoy. Basil’s interior feels more like a restaurant than a pizzeria. You can tell they’re going for a more modern, trendy vibe to their pizza. This is also apparent by their expansive menu, which is unique, to say the least. 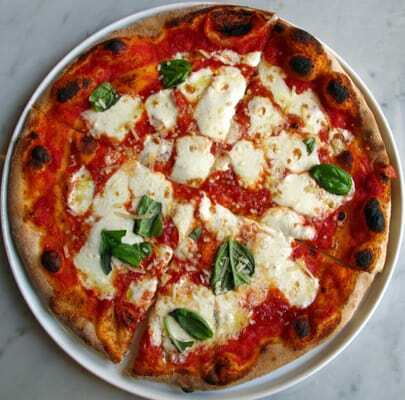 We had the classic Margherita, the Basil, and the Rinforzata. So, let’s talk good. The pizza was fresh, warm and gooey. The portions are great – they’re served as personal pizzas, but you definitely feel a little stuffed if you’re eating by yourself. The homemade fresh mozarella was seriously stellar, and you always want to have a great cheese on your pizza. 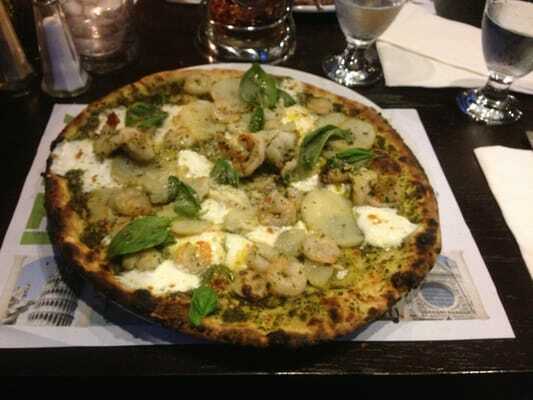 The Basil had pesto sauce, and it was an interesting choice – different from what we normally order, but we enjoyed it. It also has the homemade fresh mozzarella, oven baked rosemary potatoes, pine nuts, extra virgin olive oil, and basil. This one was interesting because the potatoes gave it a nice creaminess, while the pine nuts gave it a crunch. The Rinforzata – which is another we normally wouldn’t order, because we don’t find ourselves reaching for anchovies very often, was unique – and tasty, if you’re into that sort of the thing. The ingredients in that one are tomato sauce, homemade fresh mozzarella, italian ham, sweet italian sausage, hot dog, black olives, anchovies, parmigiano reggiano, extra virgin olive oil and basil. The Basil. Photo Credit: Shanna G.
Now for the not so good. We weren’t crazy about the crust. It was just a little too thin, and didn’t taste amazing. Also, we wouldn’t recommend you buy pizza here and walk home – as soon as it cooled down, it was hard and unbiteable (yes, that’s a word now). If you’re sitting and eating the pizza fresh and right away, you shouldn’t have that problem. Overall, we enjoyed Basil enough for it to be our pick of the week, and we can see ourselves going back if we’re really in the mood for some artisan pizza – but we’re definitely still on the hunt for the real best pizza place in Astoria. Previous articleDanny Leonard: Singer, Song Writer…and Judo Black Belt!? Next articleAthens Square Park is Almost Ready!